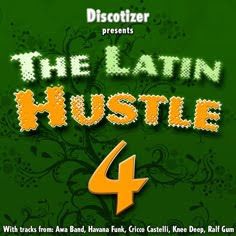 The long-awaited Latin Hustle Vol. 4 is finally here with some really uplifting and feel-good tracks for the summer. Along with great mixes from Knee Deep who pulled out some amazing Latin-House tracks in 1999-2002 my absolute favorite here is Havana Funk with its totally addictive Vocal smasher "All about you". So bad it only came out on Bargroove's Disco Heat Compilation. Also have an eye on Louie Austen's wonderful and soulful Latin-House Hit "Amore" - this is an oustanding record and should be in every DJ case. From Germany out on Muschitunes Records 2002 comes one of my new favorites: Mundo Azul with "Sereia". There aren't that many Latin-House tunes that are so funky and well arranged. Still wondering that Muschitunes first single was produced by two german guys, i've never heared of. Great job! Bravo! Great Latin dance mix! You're the best, man! HEY!!! greetings from México, sorry if my english is not very clean, i just wanna tell you that your latin house set it´s so good, a good music selection thanks for sharing!!! leider ist VOl. 4 der Latin Hustle Serie bei mediafire gesperrt. Gibt es irgendeine Möglichkeit diesen Mix von Dir zu bekommen? bin mir nicht sicher, ob mein letzter Kommentar angekommen ist. This file has been identified as a copyright protected work and cannot be distributed using MediaFire." Hast Du noch eine andere Möglichkeit das Set woanders hochzuladen. Andernfalls könntest Du auch "wetransfer.com" verwenden - falls Du es kennst bzw. verwenden möchtest.